Removals Edinburgh - Full services for removals in Edinburgh, whether you are moving somewhere in Scotland or Internationally. As professional movers we are members of the British Association of Removers. For your peace of mind our facilities are surrounded by a 10 foot security fence with 8 CCTV cameras covering all areas of our storage warehouse 24 hours a day, 7 days a week. International - If you are moving overseas, Broughton Removals can offer you the confidence in a quality removal service through our network of international contacts regardless of how big or small. Broughton Removals offer full services for removals in Edinburgh and storage in Edinburgh, whether you are moving somewhere in Scotland or internationally. As professional movers we are members of the British Association of Removers giving you peace of mind knowing that your packing and moving service is being handled by the highest industry standards. We have moved the same families time and time again, and while these families grow and move on to pastures new, we stay the same, offering the same tailormade quality you expect from us. More than 80% of our trade comes from repeat business or by recommendation. Re-located in September 2006, our office and vehicles are now based out of a new purpose built containerised facility with the capacity for up to 500 containers for storage in Edinburgh. Operating 8 modern vehicles which are inspected every six weeks and fully equipped with all the necessary materials to ensure your move is completed to the highest standard. As a traditional removal firm, our uniformed staff display our values of reliability and expertise at all times. And when it comes to our distinctive fleet of vehicles, we offer a large range of specialised, modern vehicles that cater for all types of removal, large or small. Mr Munro Snr founded Broughton Removals in 1970, later joined by his sons, to provide removals in Edinburgh from a company that offers the highest quality service at the best possible price. Excellent customer service from experienced, dedicated removal crews has been at the core of the business ever since. Our warm-hearted approach and putting people at the centre of everything we do, is why some Broughton Removals team members have been with us for over 20 years. As a result, the expertise, integrity and professionalism of our people shines through. 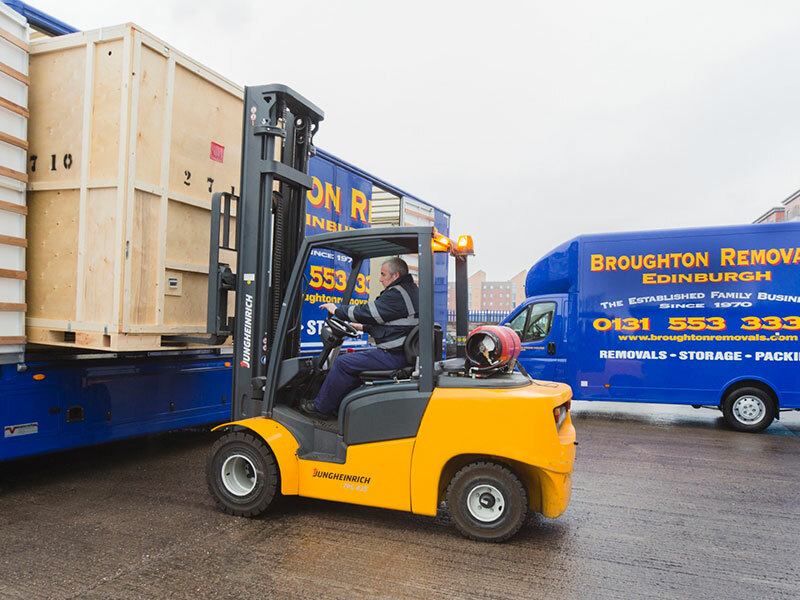 So if you are looking for secure storage in Edinburgh and removals in Edinburgh please contact Broughton Removals the professional removals and storage company you can trust on 0131 553 3333 and speak to one of our experienced advisers now.